With podcasting and add-on voice recorders, iPods and other mp3 players (here's one for $50) are finding their way into classrooms. Apple provides lesson plans and resources for using iPods in education. iPod use is not limited to just audio–iPods can store calendar items, an address book, and text notes. Apple even has instructions on pushing these notes out to other iPods. I didn't realize it, but these notes can contain links to other text or audio files. Very cool. Not yet released is Fourier Systems' Nova 5000. Fourier calls it a "learning applicance" that fills the gap between laptops and handhelds. It has a 10" color LCD display, USB ports, a card slot, built-in ports for data loggers, and runs a version of Windows Mobile. It's built for students and has a sturdy, rugged design. Supposedly the Novas 5000 will cost around $400 when finally released. How about a laptop for $100? That's the goal of MIT's Nicholas Negroponte. 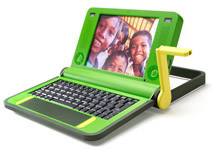 The ultra-cheap laptop is green with a yellow hand crank (for recharging). It's being designed for ownership by children in developing nations with the hope of providing a laptop for every child on Earth. It has a 7 inch screen that swivels like a Tablet PC. It runs all open-source software to keep the costs very low. Andy Carvin has posted an 8-minute video online. He talks with the chief technology officer of the MIT project. Read more about this idea in A Laptop For Every Kid on Wired.com. Leapfrog has been producing the iQuest Handheld for about two years. Retailing for $50, the iQuest Handheld is for children ten years and older. There are various game modes for students to use when studying subjects in school. In fact, LeapFrog has correlated content for the iQuest Handheld with major textbooks. You'll need to buy subject specific cartridges at $15 each. Last month LeapFrog released its FLY Pentop Computer. It's not a desktop, laptop, or palmtop–it's a pen! The FLY uses special dot matrix paper ("FLY Paper") to read what a student writes. For instance, writing a "C" and then circling it starts calculator mode. With its built-in speaker (or optional ear buds) the pen will then instruct you to draw a calculator on paper. After drawing the calculator, just tap the buttons with the pen and then the FLY will tell you the answer. The FLY also has a scheduler and various games you can play. You can even draw a set of drums and keyboard and then play them! With additional cartridges ($25-$35), students can enter their own spelling words and practice them, translate words to and from Spanish, and work through multiplication and division problems. The FLY Pentop Computer is $99 and a 60 notebook of FLY Paper is $10. You've got to check out LeapFrog's online demo of the FLY. It really is an amazing piece of technology. However, for $99 you could get a Palm Z22. There are so many ways to put learning in the hands of students. Heck, there's even a cell phone that lets kids earn extra minutes by playing learning games. Currently, Palm and Windows Mobile computers seem to be the most versitile since they have computing platforms where anyone can development software. However, task-specific handhelds can be great learning tools as well. Whatever the "handheld," students are able to interact with content, organize information, and communicate with powerful devices that can fit in their hands.